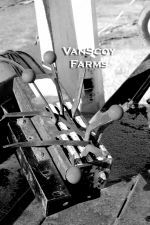 Come and share a Mystery Tour of VanScoy Farms! We have various pieces of equipment and products that are utilized to grow the HEALTHY food which we offer to you. Amazing how many intricate parts must work in harmony for us to have a successful day on the FARM. We find ourselves using problem solving skills, mechanical knowledge, welding experience, agriculture education, and experiences earned from the school of hard knocks. Common sense is invaluable to us daily as we encounter numerous incidents to surprise us and keep us on our toes. Never a boring day in our world. 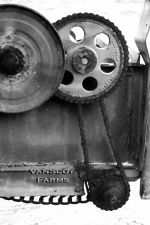 Join us in our MYSTERY TOUR of pieces of equipment... Each picture is taken in black and white and narrowed in on one aspect of the equipment. Try to guess which food we are growing, harvesting, or nurturing with each one. Enjoy.